If you’re an active person over 40, chances are you and your friends have commiserated about pain in your joints and back. And, it’s very likely the conversation has turned to “arthritis.” It’s a dreaded topic because it is a discussion about your discomfort doing outdoor activities you’ve always enjoyed with such ease in the past ­— golfing, running, biking, playing tennis, etc. Most people believe the only resolution to their pain problems is major surgery. But, according to Dr. Tim Canty, a New York-based doctor, there is a new, less invasive solution that could treat your discomfort and get you back to doing those hobbies you really enjoy sooner than you thought possible. After training at Harvard Medical School, Dr. Canty founded the Comprehensive Spine and Pain Center of New York. Dr. Canty believes patients who suffer from different types of joint pain and injury-induced pain, specifically in their knees, choose to opt out of treatment altogether because invasive surgeries may provide only temporary relief or are only minimally effective. Others are turned off by long recovery times and horror stories about botched surgeries. 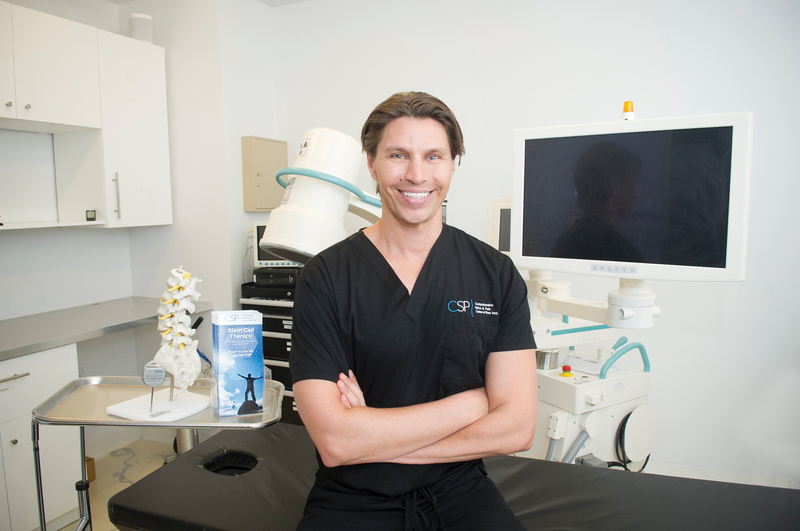 Social Life recently caught up with Dr. Canty to learn more about the science of stem cell therapy, its efficacy, and who might be a good candidate for its pain-relieving methods. Stem cell therapy is still a relatively new concept for many people. What is it and how does it work? Stem cell therapy can treat joint and spine-related pain with a simple 30-minute procedure, and in most cases eliminate the need for surgery altogether. Essentially, stem cells from the patient are used to restore balance in the injured tissue by utilizing the human body’s ability to heal itself. Surgery just can’t recreate what the body can do naturally. Everything is natural and of your own biological material. What about rods, plates, pins — all those items doctors have been using for years? In special injury cases those materials are sometimes necessary. Because this has been the norm, people are more likely to undergo surgery for pain. But in most cases, putting those objects in our bodies can be avoided with stem cells. Stem cell therapy catalyzes natural healing and repair. We’ve had great success with many orthopedic conditions, injuries, and musculoskeletal diseases that formerly required the types of items you mentioned. What is one of the most common procedures you perform? I would say about 50 percent of my patients come in for treatment of knee pain due to arthritis and injuries. People have been told they need knee replacements or arthroscopies. The stem cell therapy is incredibly successful for the knees because it focuses on healing the specific tissue causing the discomfort in order to organically restore your knee instead of replacing it altogether. This is a non-surgical method of treating chronic pain, so it offers reduced downtime and peace of mind through a simple procedure. Most people are active within a day or two, and then playing tennis or golfing within days or a couple of weeks. That is never the case with conventional surgery.